Romans 1:20 - For since the creation of the world God’s invisible qualities - his eternal power and divine nature - have been clearly seen, being understood from what has been made, so that men are without excuse. Clients of mickwood.com are NOT obligated to use us to register their Internet domain name. 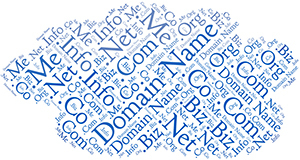 We know that there are many companies that offer cheaper domain name registration services. Do you have the technical skills to configure / maintain / update the DNS for your domain. Do you have the systems in place to ensure you don't forget to renew your domain? Do you have the systems in place to ensure you keep your records updated with ICANN and / or Nominet? None of the above tasks are difficult but not keeping up to date can be expensive. For example, the financial consequences of forgetting to renew your domain name can be significant or even disastrous. At mickwood.com we assume the responsibility to ensure that all key domain name functions are carried out in a timely manner. If you would like us to register a domain on your behalf please email mick@mickwood.com to start the ball rolling.